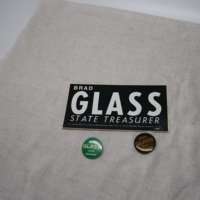 Brad Glass was Illinois State Treasurer from 1973–1979. Although not stated, these buttons and sticker are most likely from 1972--before he came into office. Brad was a part of the Republican Party.